On his ninth birthday, Louis Drax's (Aiden Longworth) mother (Sarah Gadon) plans a picnic for the family at Land's End, a cliff on the sea shore. When the boy falls off the cliff and drowns, he's clinically dead for two hours. Miraculously, he comes back to life, though he's in a coma. Dr. Pascal (Jamie Dornan), an acclaimed neurologist, is drawn into the mystery of the young boy, who has survived eight near-death accidents in his life. When media reports are released saying the boy was pushed, fingers point towards his father (Aaron Paul), who's believed to have a violent temper. Worried when the boy doesn't come out of the coma, Dr. Pascal wonders if he's waiting until he feels safe. With the help of a colleague (Oliver Platt) he uses scientific methods to connect his brain to Louis's to find out the truth, and witnesses strange sights. 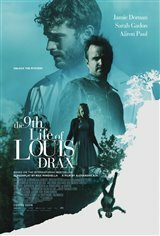 Based on the novel The Ninth Life of Louis Drax by Liz Jensen. The 9th Life of Louis Drax movie clip - "Too Much of a Good Thing"